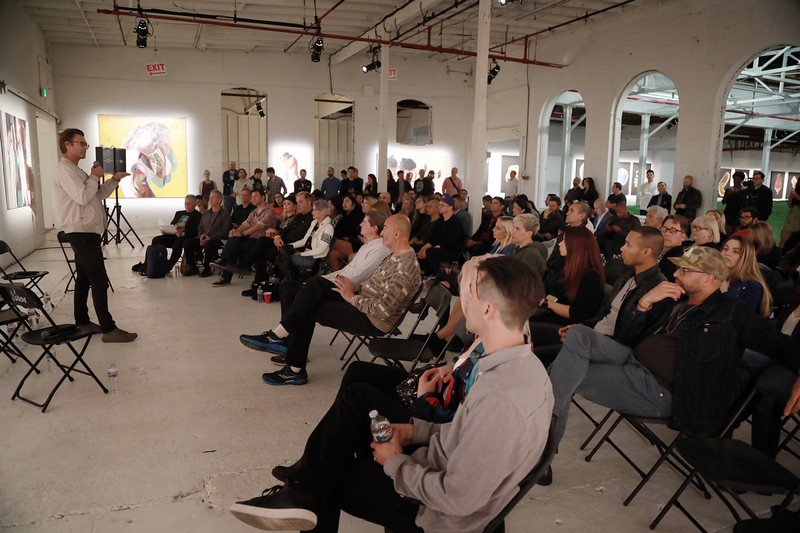 Held at The 14th Factory, Simon Birch’s sprawling 150,000 square foot art installation, a packed house of VR producers, technologists, art world figures and students were treated to an invigorating conversation about the intersection of VR and immersive art this past weekend at CFC Media Lab’s COLLISIONS VR salon. Simon Birch addressing the Collisions VR Salon audience. All photos by Eric Minh Swenson. 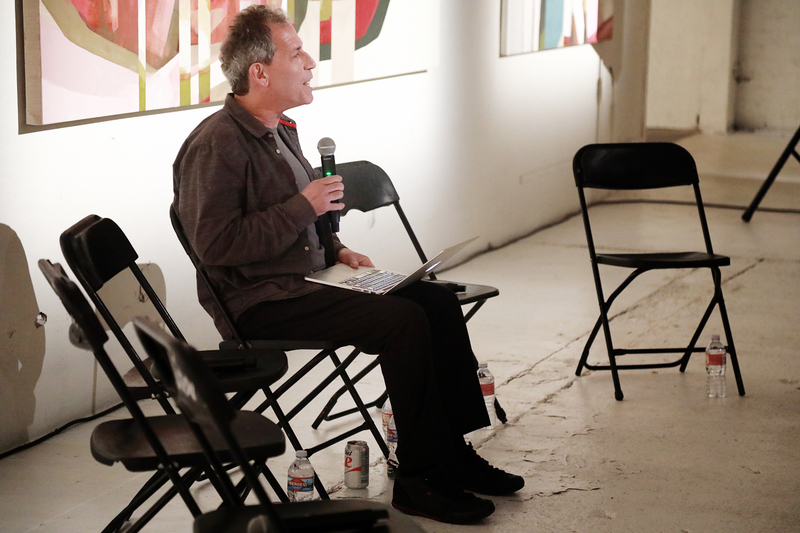 Michael Naimark, artist, inventor, scholar and Google’s first-ever resident artist in its VR division, kicked off the evening with a keynote address that touched on four “vignettes” about lessons learnt in his career as an artist and technologist. 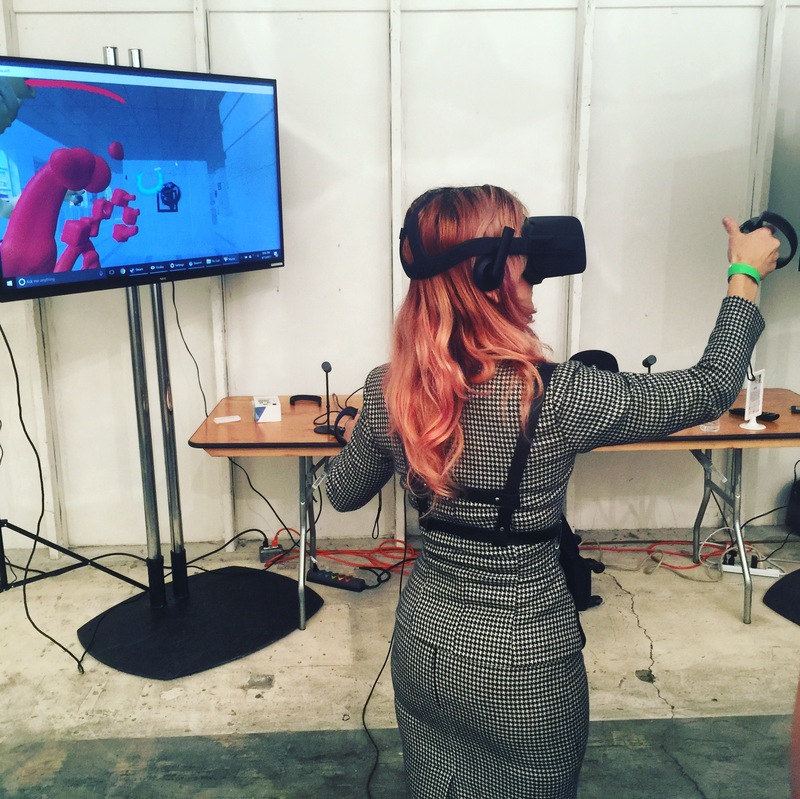 This idea set the tone for the evening – that researchers and developers working in VR tend to focus on the technological aspect but sometimes forget to check in with artists who might be able to subvert their thinking. Michael Naimark addresses the crowd. Naimark’s vignettes focused on his time at Paul Allen’s Interval Research Corporation, where he worked in the 1990s; at USC Cinema’s Interactive Media Division where he taught in the 2000s; and on his recent experience at Google VR; and were divided into the categories of Research & Development, Art & Money, Content & Technology and Focus & Perspective. He finished his keynote with a rallying cry. Following Naimark’s address, Ana Serrano, CFC Chief Digital Officer, and founder of the CFC Media Lab and CFC’s digital media accelerator, IDEABOOST, led a panel of major figures in the fields of art and VR: Thomas Wallner, an award-winning filmmaker and CEO and founder of the Liquid Cinema VR platform; Samantha Mathews, co-founder and CEO of Venn.Agency, an immersive art agency focused on building an infrastructure to introduce more VR onto the web; Los Angeles-based sculptor and performer Elizabeth McGrath; Keram Malicki-Sánchez, founder of VRTO (Toronto’s VR Conference and Expo) and FIVARS.net (Festival of International Virtual and Augmented Reality Stories); and Simon Birch, whose self-funded exhibition took five years to create and contains a replica of the bedroom from 2001: A Space Odyssey, among other surprising installations. Ana Serrano leading the panel discussion. 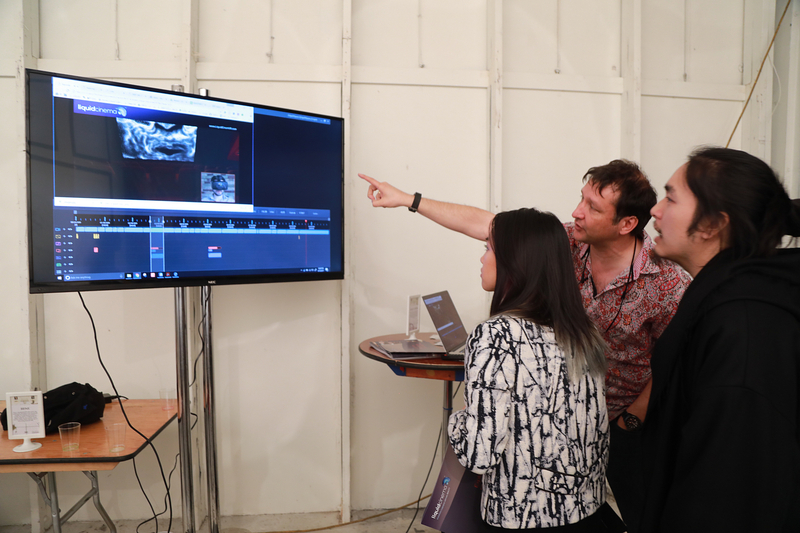 Thomas Wallner of Liquid Cinema doing a demo. The conversation turned to empathy, and with the panelists agreeing that VR has been railroaded into being seen as an “empathy machine”—often the technology is used to put people in war zones or allow them to experience abjection. “It’s actually an empathy killer,” said Wallner, who described being immersed as something that can distract from the reflection that the distance between the viewer and, say, a film might foster. After the discussion, the audience demoed Wallner’s platform and the works of two other IDEABOOST VR start-ups — FilmTyme, who have created a suite of tools that allows users to “record” and make films while inside VR environments, and Brinx Software’s MasterpieceVR, which is an incredibly intuitive collaborative VR sculpting program (like being inside a virtual reality Photoshop with other people). As for Birch, he was pleased that the VR audience was taking in his work and engaging with the work. Before the panel, he relaxed in the café area of the exhibition and marvelled at the VR crew inhabiting the space.